The coastline of Anglesey and the Llyn peninsula has been a well-known lure to enthusiastic sea kayakers for many years. 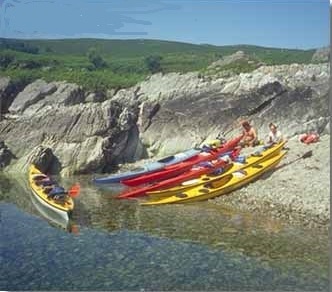 The combination of the wildlife, landscape and the sheer variety of sea conditions that are encompassed within such a small radius, all provide a challenging and attractive environment through which to paddle. Seals, cormorants, razorbills and guillemots are commonly to be found amongst the stacks and cliffs. You may even catch a glimpse of a puffin or porpoise drifting past. Geologically the rocks here represent some of the oldest and most interesting to be found in the U.K. as they twist and fold in some bizarre fashions. There are many beautiful sand and shingle beaches to be found at the heads of the bays and inlets providing ample sites from which to begin and end journeys, all with good vehicle access. Once afloat the tidal effects quickly come into play. In an area of relatively little movement you can relax, work on skills and enjoy the time afloat, or we can go for an area with maximum tidal movement to provide the additional challenge of fast moving water to your days activities. Wherever you go, looking at and understanding the sea becomes an essential part of what you are doing. It is true that Anglesey cannot claim to be a wilderness area as perhaps you may be able to find in Scotland, but there is certainly a feeling of isolation as you paddle out to visit an island, pass along a cliff face or camp on one of many beaches. We have the perfect journeying and training area, all within easy reach of our base. There will also be the chance to delve into theoretical topics including: tides, weather, expedition planning and knowledge and design of equipment. Prices are dependent on the length of course you would like to complete. Alternatively, you are welcome to bring your own equipment. Pre-course experience: Groups are organised to fit in with demand and ability. As a minimum level, you should be confident swimming in the sea and putting your head under the water. If you are in any doubt, please do not hesitate to contact us early so that we can discuss any questions you have.